With so many unnatural energy fixes on the market these days, we thought we’d try these two more natural products that promise to energize. After all, who doesn’t want more energy for your workouts—and life?! So this one was a new one for us. We had never heard of “Mamajuana,” which frankly sounds like slang for you-know-what, but were curious to try (as it is not slang for you-know-what). Apparently, centuries ago, natives of the Dominican Republic used a distinct blend of botanicals to help the body adapt to stress, increase energy and improve immunity. The recipe is a drink the natives know as—you guessed it—Mamajuana. The unique tea is naturally brewed, caffeine-free, sweetened with organic agave nectar, and contains cinnamon, cloves, sarsaparilla, maca (more on maca’s bedroom powers in the next few weeks!) and other herbs. And the taste? It’s interesting. Kind of like the time my husband made the hot drink wassail out of the blue, and more importantly, out of whatever juices, beer, spices and liquor we had around. It was pretty good, but unique to say the least. At first, I really didn’t like the taste—it’s very cinnamon-y and clove-y. It’s also sweeter than I expected, and as someone who likes her tea sans sugar, you can imagine that I wasn’t pleasantly surprised. However, after a few sips and coming to expect the flavor, I got used to it. I’m not going to say I really, really liked it, but it wasn’t bad. And it did seem to give me a slight energy perk, like caffeine would. With 50 calories a serving and two servings a bottle, it’s also pretty low-calorie for the sweetened tea world. We normally don’t snort things on FBG, so this was another unusual product for us to review. But alas we did, always the humble guinea pigs for healthy living. So basically Boom Boom (cue Black Eyed Pea’s “Boom Boom Pow” please) is a form of all-natural aromatherapy. Derived from herbs and a blend of menthol and natural essential oils, the company says it provides instant energy, mood enhancement, mental acuity improvement, appetite suppressant and breath refreshment. And the verdict once stuck up nose and sniffed? Definitely more awake and alert, not totally sure on the appetite suppressant (but I had just come back from a long run, and you can’t really fend off the ravenous hunger after one of those) or the breath refreshment (that one sounds like a stretch to me). The inhalers come in three scents: Cinna-Mint, Tropical Rush and Berry Breeze. Cinna-Mint was by far my fave and perked me up the most. Tropical Rush takes a close second and makes you want to go to the Bahamas. Oddly enough, the Berry Breeze probably seemed to have the most effect on my alertness, but I thought the smell was too sweet to really enjoy. 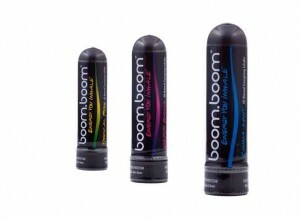 Each Boom Boom retails for $5 for a single unit or $12 for the variety pack of all three. One inhaler lasts for about two weeks once opened. While I don’t think I’ll be buying these after my sample pack runs out, I do think they were fun to try, and they did help wake me up before an early morning workout! If you have problems getting going, you might want to give them a try.